The two photographic series currently on display in the Corban Homestead Galleries give the viewer a private insight into the worlds of the two artists, Bernie Harfleet and Donna Sarten. As strangers we are given uninhibited access to the personal worlds of people that we have potentially never met, as well as those of their adopted parents, and this unexpected disclosure is unnerving. It also encourages us to ask questions as to why we are being shown these intimate portraits, pulling the viewer into a contemplative space and viewing these photographs with a curious yet respectful and sympathetic eye. These photographs almost reveal more about the viewer than the artist. Perhaps this is the intention of the artists. Bernie Harfleet shares a studio with Donna Sarten at Corban Estate Art Centre, with Harfleet crediting his fellow tenants as being his greatest influence. The creative and cooperative environment of the studios on the Estate has been of great benefit to the artist in regards to seeking counsel and support, which is linked to another major interest of Harfleet’s: sociology. “I am interested in what makes the human animal tick and in particular man’s inhumanity to man.” He has explored this topic within several media, including painting, sculpture and photography – initially a painter of oils, Harfleet moved to a more diverse range of media as they enabled him to depict ideas in different ways and enter discussion with his audience. At present Harfleet is putting together a proposal to tour Norm & Noeleen around New Zealand galleries as well as creating a piece addressing domestic violence for Sculpture on the Shore which raises money for women’s refuge. He was also recently included in the Art of Assemblage exhibition as part of the Erupt Festival in Taupo. 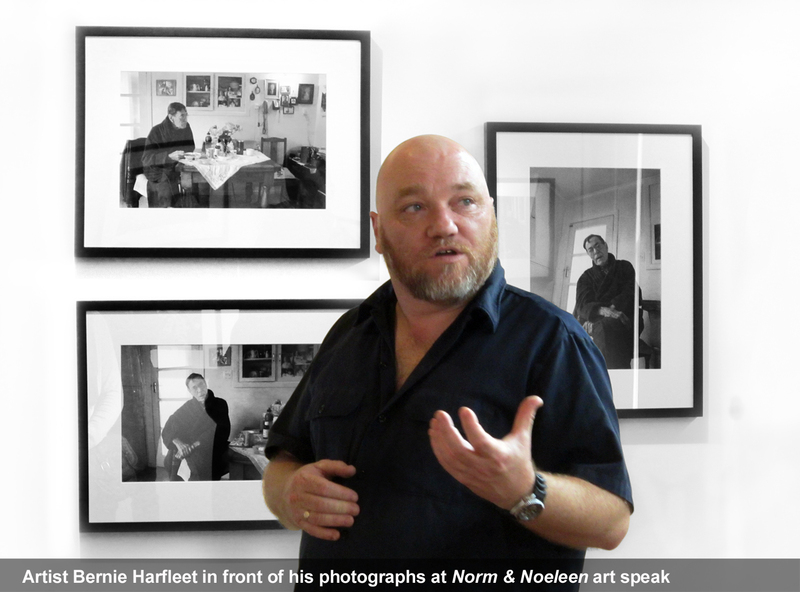 The bottom line for Harfleet is that his works are well-made and resolved to the point that the viewer is the next element to add, so one can be rest assured the next work you see by Bernie Harfleet will have the 100% approval of the artist.